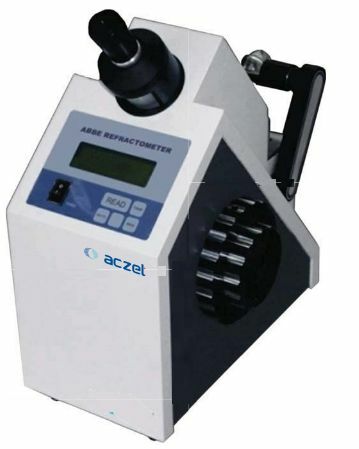 Refractometer is an indispensable regular instrument used in the petroleum industry, oil industry,pharmaceutical industry, paint industry,food industry, daily chemical industry,sugar industry and geological prospecting and other relevant factories, schools and research units. Apparatus equipped with an optical system made of a telescope with dispersion correction, used to define the division line between dark and bright areas. Measurement of the Brix of sugar solutions. Precise optics with automatic temperature compensation Visual aim LCD display, as oBrix and sample temperature. Stabilized temperature connection for water bath. RS 232 output withsoftware Included. Push Button for Brix without temperature correction “Bx”. Push button for Temperature indicating. “TEMP”.